Candace. What is this all about? I've never heard of it but then I'm a new blogger, so I'm not surprised. This sounds very interesting. I will be back tomorrow. Coming from So. Calif. where it is never really winter, I would have to say I could be anywhere in winter as long as it was snowing and I could sit in front of a warm fire, sipping on a cup of hot chocolate, and watching the snow fall. Please enter me in the giveaway, and Happy New Year! Where would I be in Winter if I had my wish is right here where I am with friends and family. No matter what weather we are having. favourite place in winter is sitting in a chair sewing on binding! its too hot any other time of the year (unless the a/c is pumping)..
its summer in Australia and very very hot at the moment.. I hate summer and can't wait for winter! best wishes for 2009 to you and yours.. I would love to experience England in the winter. Tasmanian winters can be cold but not too much snow. I love those photographs of english villages with snow topped roofs. Hey Candice, Happy New Year to you! My favorite place to be in winter would be a nice log cabin up in the mountains with my family, hot chocolate, some boooks and my sewing machine! But since I don't have a log cabin, my favorite place is snuggling on our couch while I sew and my hubby and son read books aloud! Since I live in American Samoa, anywhere where it is cool and since I am here, I would love to be in Texas where two of my sons are...(I know that is not very wintery). Happy new year! I would love to enter your lovely giveaway. My favourite place in winter is sitting on the couch with some hand quilting to do and a view of the rainy weather outside. I love winter! In my favorite wing back chair hand quilting away the days while it snows outside! Oh I would love to make this quilt and I love their fabrics, great giveaway, thanks!!!!! What a lovely group of prizes. As to where would I be...well if winter is involved then I like to be sitting by a roaring fire drinking tea and sewing. What a super giveaway! My favourite place in winter? In front of a fireplace with either a quilt to work on or a very good book! My favorite place in the wintertime is like now when it is minus 23 C outside is in front of the fireplace stitching in company with my DD. exactly where I am now, in my home in Florida. It is chilly where I live but I simply love it here. I never want to leave. No matter what the season, I am always happiest when I am with my family! My favorite place to be in winter is anywhere I can be with a quilting project. Thanks for the chance to win the great giveaway! My favorite place to be this winter would be North Carolina visiting with my new grandson! My favorite place in winter is my chair in the sitting room, either working on some hand sewing or reading a good book, with my dogs at my feet. This looks very fun! After the snow we have had this year, I am tempted to say that my favorite place to be is Mexico but really it is curled up in my chair with a good book, some applique, or knitting and a cup of hot chocolate. I would like to be in Seattle this winter...and spring...and summer...and fall! My favorite place to be in winter is in front of a warm fire doing some handwork or working on a quilt. If I had to choose a geographical location, I'd wish it to be Colorado, in front of a fire, etc., etc. LOVE WINTER! I also like to be by my woodstove, knitting or sewing. My favorite palce in winter is snowed in at home--with plty of stuff to make homemade soup and bread! Happy New Year from Orkney in Scotland! I would love to be sitting by a roaring log fire in a pretty room, with a lap quilt over my knees. I would like a cup of tea or coffee (no milk, no sugar) on the table beside me, a bar of chocolate and a piece of sewing. Bliss!! Anywhere I could feel the snow fall on my face. I miss a good snowfall. We just don't get that many here in GA. :)So, instead, I will be in teh craft studio making snowflakes, among other things. Thanks for such a sweet giveaway and Happy New year to you. Candace, I love your giveaway. This will be fun. I could be anywhere in winter I would just stay home. I really am a homebody. Happy New Year. Where I want to be in Winter? Anywhere that has a lot of snow is where I'd love to be! If I could be anywhere in winter, I'd be in New York City. I love walking in Manhattan and looking at all the store windows dressed up for the holidays. The giant Christmas tree at Rockefeller Center and watching the ball drop in Times Square on New Year's Eve. Happy New Year! If I could be anywhere in winter it would be New York City - I've only traveled there once during the holidays and I crave the atmosphere every year! Thank you for doing this! If I could be anywhere in winter, I'd be spending it with my son in Florida ... all that sunshine and no snow!! This Floridian would love to spend another Christmas in New England, as long as my family went with me! I would be just where I am now, at my home in southern part of Norway. Here we can get some snow, but mostly not too much. I would be in the Caribbean - and that's where we'll be going this winter too! My favorite place is right here at home. With a refrigerator full of good food, my favorite coffee and creamers, and plenty of sewing to keep me busy. Preferably with a light snow falling every day and minimal housework! Oh would I love to be on a ski slope...my favorite place in winter. 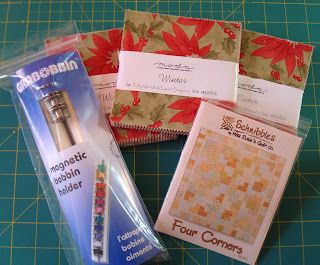 Great gifts.....I am currently working on an applique quilt using the Winter fabrics...love them. My favorite place in winter is at home on vacation! Reading, knitting, quilting, watching movies. I'd love to spend some time in the winter in a place that gets snow but that isn't over populated. But still, there's no place like home! My favorite place in winter is my uncle's house in the Alps with the all family, hot chocolate, skiing and cheese fondue. Lovely giveaway! If I could be anywhere this winter it would be in Acapulco, Mex. visiting my in laws. They sounded like they were having such a good time last nihgt on the phone! My favorite place in winter is home as there is no place like home :) I would like to be in Texas for a short break from the cold where my mom and dad go for the winter. My favorite place would be.....right where I am, at home in my recliner stitching away, surrounded by my loving husband and my 4 legged children. Wonderful gift, I'll keep my fingers crossed. My favorite place to be is right here at home. Near two of my children and my three grandchildren. I have my applique and quilting here and have things just the way I want them. Why go somewhere else? I would want to be right where I am this very moment, in my living room, sitting on the couch across from the fireplace, with a toasty fire warming me, with my dog at my feet and my sewing on the table next to me. My favorite place in winter is also by the fireplace watching a movie with the hubby and kids! Or maybe in bed with the electric blanket turned up! Thanks for the chance to win! "if i could be anywhere in winter, where would i be?" ummm i rather like being here in ohio at winter time. The one place I would love to be in the winter is an easy choice. Curled up next to my awesome husband. I don't care where I am in the world as long as it's by his side. Thank you for offering such great prizes. Quebec City in Canada or Switzerland. Sigh. I would have to say that my favorite place is right at home. Although, a week in the Carribean wouldn't be hard to take either! Aloha! I would love to be in a cold place where there's lots of snow! Maybe the Pacific Northwest! I've lived here in Hawaii ALL my life & the only snow I ever see is atop Mauna Kea!! I had the opportunity to be in Oregon in Dec. 2007-Jan 2008 & was so BLESSED to experience being somewhere it was snowing for days! Loved it! My favorite place to be in winter is somewhere warm. My poor old bones don't love the cold. I like a beach, even if it isn't warm enough to lay in the sun. OR I like to be in Merida Mexico which is in the Yucatan. I beleive it is in the 80s there today. What a fun giveaway! If I could be anywhere in winter I would be with my little family at a cabin in the mountains that we have "borrowed" from friends before. It is snowy and beautiful there. As long as there is plenty of food to eat and games to play as a family, I would be happy! Hi Candace, I'm reposting because first time around it wasn't Jan 1 in your time zone. So, here I go again. My favorite place in winter is snuggled up inside with a good book or a sewing project. My favorite place to be would be a warm cabin with as great fire and a sewing machine close by. I love the quilt on your header. You also have a very generous giveaway. I would love to be on a warm beach during the winter, but being home is not so bad either! Thanks for entering me in the giveaway! I would be here, I love winter! except at the moment I would be somewhere with some heat! If I could be anywhere in Winter it would be in Austria with my 2 grandchildren. I think I'd like to try Hawaii, or some Caribbean cruise--because I've never been to either! But, as long as hubby's with me, it really doesn't matter! I would be home alone and quilting! In winter, I love to be home for a good snowstorm, with candles burning and a pot ot tea ready. Perfect sewing weather! I would love to be in Utah at a nice Ski resort relaxing! Anywhere for winter - have to pick here, in Duncan OK. I have my family and friend, it rarely snows, and life if good. I wouldn't want to be anywhere other than right where I am....with my family enjoying the snow in Massachusetts. I want to be in TN watching a little snow fall in front of a warm fireplace with my husband beside me. If I could be anywhere I would be someplace snowed in, with a fire and a stack of quilt projects to work on! I would like to be in Hawaii! Thanks for entering my name in your giveaway! Happy New Year. I would love to be anywhere that didn't reach negative numbers in the weather temp!! (I live in Alaska! It's negatvie 25 right now! Fantastic! Lovely charms and fabulous pattern! Nice bobbin holder, too. Call me crazy, but I would love to be somewhere surrounded by snow. Some fancy, schmancy ski resort; I could enjoy the snow outdoors, and then a hot-toddy by the fire inside! Count me in on your drawing - so generous! Since I'm not one who enjoys the cold, I'd rather be in Far North Queensland for winter cos it's warm up there all year round :o). Anywhere in winter.......it would have to be Lake Tahoe, CA. So beautiful. We went out 2 years ago in June, how amazing. Although it was the start of summer for us here in NC, they still had snow in Tahoe. I love the charm moda packs. I WANT, I WANT. Don't get me wrong. I love winter. But by around the end of January I would love to be anywhere warm. The Caribbean would be nice! Thanks for entering me in your giveaway. well, how fun is this! where would i like to be???? i know this seems weird, but anywhere there is consistent snow...i love winter, snow, ice...i miss skiing, skating, sledding. I would like to be with my family! Growing up in South Dakota we also had real winters, not snow for two days like other states, or no snow at all like the south (where we are now!). A real winter so we could make snowmen and have snowball fights would be awesome. Which we did last year and it was a lot of fun! I would want to be on a warm beach....but first I'd have to hope I could get to an airport that wasn't having flight delays because of bad weather! So...I guess I'll be content to stay with a quilt by the fireplace. NICE prize package and I'd love to win it. I hope you visited my blog to enter my giveaway, too. I love it right here in central Illinois! We had an ice storm (a terrible one) but it was so beautiful! Moda Winter was my favorite for Christmas this year! What a great giveaway! I do enjoy your blog very much! If I could be anywhere in winter, it would be right here on our farm in Oklahoma! Best wishes for blessed new year. Corny - but I I like right where I am at - nothing better! In winter it seems right to be in a cold climate. Fun giveaway! Great giveaway, I think the best place to be during winter is HOME. It is very cold here right now, so i will say it would be nice to be in Hawaii with my family. Very generous giveaway, please please enter me into your drawing! I would like to be at Home in front of my fireplace with my kitty snuggled up with Eggnog! Oh thats sounds good right now! What a wonderful giveaway! I love being with my family and they love the snow, so my favorite place to be in winter is next to my fire watching them play in the snow through my big window! Well would be nice to be in our fav winter RV holiday place, St. Auggie, Florida! Since we can't I enjoy snuggling up on sofa with a quilt, book and warm fire in the hearth. Love all the items!! Happy new year, dear Candace. You have a lovely giveaway! My favorite place for the winter would be somewhere where there is nice snow and the sky is bright blue, with a wonderful view to the mountains. Yes, I can imagine myself sitting there! My favorite place to be in winter is on the sofa with a quilt over me and a cup of tea and a good book close at hand! If I could be anywhere, it would be on a warm beach watching the waves and soaking up the sun. My favorite place in winter is on the someplace where it doesn't snow or ice. anywhere with sun, sun, and more sun, sand would be nice too! My favorite place to be in winter is at home, under a quilt with a handcraft project and a nice glass of wine. If I could be anywhere in winter, I would choose somewhere there was a ton of snow with the possibility of being snowed in as long as I had lots of craft projects, of course. Oh, I guess I should pay attention to the rules. LOL Hmmm, I love the snow and am happy where we are but sometimes if it's still snowing in May, I long to be in Hawaii sitting by the pool with a good book! What fabulous gifts in your give-away! I'd love to win!!! Thank you for participating and adding fun to the blogging community. My favorite place is on the couch in front of the fire-place with a book and my dachshund. I'd also take a cabin in the Rocky Mountains with plenty of snow and a warm fireplace. I'd choose to be in our honeymoon cabin in Montana. Our anniversary is the 15th and we chose to honeymoon in the mountains of Montana with lots of snow. Nine years and going strong! First I wish you a very happy new year. I like to win, please be so kind and enter my name in the give a way box. Best in the winter is to sit on a hot fireplace with a : german colled it "Glühwein", i dont know it in english, and have a good book to read. If I could be anywhere in winter, it would be in my studio creating. But working on something for me rather than for clients. This prize would help me do that! I would love to be anywhere warm. It is cold here in Ohio. I love being with my sweet dh in the wintertime. I would like to be back in the famous Blizzard of 1977 (yes, I'm old!). I was snowbound for a week with my two young children: warm, cozy, plenty of food, nothing to do but play, watch TV, read, and sew. I made a suit. I'd do that again anytime. I like being right here even if it is -25. My sewing studio is nice and warm! I'd like to be on the beach in Maui doing some embroidery! Right now I'm looking at a new 6" snowfall in SE Washington... it's really beautiful, but 3 feet+ is enough! I love a cold raining day spent in my quilt studio with favorite music and quiet home as I stitch away my hearts content....oh....am I dreaming?.....I was heading there! Easy! I'd be where I am, in front of the fire with my family. Christmas time/Winter time is the best to be with family. I like to spend my time hand quilting in the winter, so I guess I would want to be right where I am...home with a quilt in the hoop! At home, so I don't have to go out if I don't want. In the winter I love to be at home with my son and husband and a good book, board game or project! My favorite place to be in the winter in on the sofa, snuggled underneath a quilt watching movies. Awesome give away!!! I'd love to be in a cabin in the mountains with some great quilting projects....like the one you're giving away!! What a fabulous giveaway. I would like to be somewhere south. Probably Australia where it is summer right now. Great blog and great giveaway. As a fly fisherwoman you can appreciate I went ice fishing during Christmas with my family. Caught enough for dinner too....Please enter my name for the draw. I am finding so many more blogs to read. Love it. I guess that means I like being out on a lake in the winter. tee hee. thanks for doing this giveaway! I would love to visit Maui every winter. That would be amazing! IN the adirondacks in a cozy cabin with my family. Lucky for me home is not far from that reality. I'm a beach person. Nothing to think about on that one. Thank you for the great giveaway, happy new year! I would be in Tahiti again. It is gorgeous and WARM there. Thanks. I can't decide between two options: I'd be curled up on the couch at home with a warm blanket, a cup of tea, and my latest knitting project, or I'd be out in the snow on a cross-country ski trail. I would choose to be in Arizona where it is warm and sunny and my granddaughter lives there. I'd like to be with my family, and that happens to be in Colorado. The snow is nice when it's falling and fresh, and I can stay inside and sew or read, with a big quilt on my lap. But I wouldn't mind a weekly Monday sunny beach excursion! PS I am making goals, not resolutions, myself! I'd be on a beach in the Caribbean! Living in PA in the winter, other than being in my house next to a roaring fire, I guess that I would like to be on a beautiful tropical island. Instead of feeling the bone chilling wind I would be enjoying the warm tropical breezes. Thank you for entering me in your very generous giveaway. Well, we get a lot of snow here so I would pick some where warm! What a nice giveaway. If I could be anywhere in winter, I'd pick the south of France...as long as I could take my sewing machine with me! Candace, what a lovely giveaway! Love your give-a-way. Thanks for the opportunity to win! If I could be anywhere in the world it would be just right where I am...HOME...in Alabama. Please enter and if you like my blog would you consider adding it to your blog. Again thank you and I will be offering something to give a way each month. My favourite place in winter, under a cozy quilt sipping hot chocolate. If I were wishing on a winter star, I would want to spend the winter in San Diego where the climate is so much more pleasant than here in MN. But I actually like snow as long as I can spend my time in my sewing room and don't have to shovel too much. My grandson likes to visit and calls my sewing room "cozy". :-) Would love to be entered in the drawing for your great giveaway!! My favorite place to be in the winter is looking out at the snow covered landscape from a picture window as I quilt. I would be somewhere warm and dragging my family with me of course. As long as I am with my family I am happy though. Thanks for the chance! Oh I wouldn't be anywhere other than my own hearth. It's my favorite place on earth! Hmmm, my DH would say 'Palm Desert'!! But I would have to say at a condo in the mountains - must have fireplace and large windows looking out on the slopes! Where? Of course in my sewing room creating warm quilts! I'm happy in the winter as long as I'm inside with the fireplace on, sitting in my leather chair hand quilting with my cat covering my legs. Nothing better! Please add me to your list. 1st, what a generous giveaway! 2nd, my favorite place in the wintertime is snuggled up with my hubbie, my son (16mos) and my two doggies on the couch, drinking hot cocoa. Barring that, I would take Las Vegas! My favorite place to be in winter is at my cabin in northern Michigan. It's the only place I enjoy all the snow. Thanks for including me in your drawing. Great giveaway. I think my favorite place to be is in my sewing room. Enjoying the peace and quiet. i have always wanted to experience winter in England, so that's where I'd like to be! Like so may others here, my preference is to be at home in the warm sewing - add to that, whilst watching a favourite old film on TV. Thanks for hosting a great giveaway. I just found your blog through the WIW-website and I'm glad I did! Your blog is now on my rss feed list - I love the work you show and I'm already looking forward to reading more of you ;o). I would be in San Francisco with my daughter and grandson if I could be anywhere. Well, my husband thinks he needs to be in Arizona playing golf. In all reality, I would probably pick home with my cats and sewing. I am a terible home-body. Anywhere? I'd like to be in a cabin in the mountains and not have to go out for anything. I'd just watch winter happen all around me. Someplace where the wind chill is considerably less than -27. Would want DH and my sewing machine, not necessarily in that order. But OK, he's a keeper. He washes dishes. I would be in Washington visiting my daughter. If I could choose anywhere in the world to be in winter, it would be right here in Kansas on my 5 acres, stitching away and enjoying the snow. A very Blessed and Happy New Year to you! "If you could be anywhere in winter, where would you be?" I'd love to be anywhere that's HOT ... like the equator. I'm so cold with all this winter. thanks. What a great give away!! Where would I rather be? Maybe Hong Kong? Thanks for doing this!! My favorite place to be in the winter is snuggled up under a quilt in front of a nice warm fire.